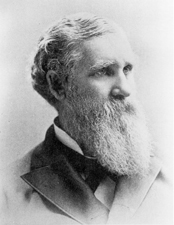 STOCKBRIDGE, Francis Brown, a Senator from Michigan; born in Bath, Maine, April 9, 1826; attended the common schools; clerk in a wholesale house in Boston 1843-1847; moved to Chicago, Ill., and opened a lumber yard; moved to Saugatuck, Allegan County, Mich., in 1851 and engaged in the operation of sawmills; also interested in mercantile pursuits; moved to Kalamazoo, Mich., in 1863 and engaged in the lumber business; member, State house of representatives 1869; member, State senate 1871; elected as a Republican to the United States Senate in 1887; reelected in 1893 and served from March 4, 1887, until his death in Chicago, Ill., on April 30, 1894; chairman, Committee on Fisheries (Fiftieth through Fifty-second Congresses); interment in Mountain Home Cemetery, Kalamazoo, Mich.
U.S. Congress. Memorial Addresses. 53rd Cong., 3rd sess., 1894-1895. Washington, D.C.: Government Printing Office, 1895.